I have a dangerous fascination with (and am somewhat intimidated by) anything that involves large tools or loud noises. I would LOVE to learn to make furniture or have great skill in fixing machinery, in part just to prove to myself that I could! The list of crafts that could easily seduce me is very long, and reads like a complete list of crafts. My top picks? Stained glass. Woodworking. Art Quilts. Metal smithing. Well, for my etsy store I make cards and draw my dragonlings, so these are the creative things I do regularly. I suppose I could have put printmaking and painting down here as things I am passionate about, but I haven't done either in several years. PS. 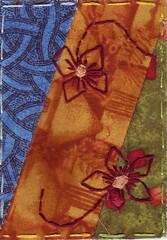 I also create ATCS and ACEOS--those have been collaged, sewn, and drawn. I'm not sure if those are their own category or not. Hrm. Which reminds me, I didn't list collages above. I LOVE collages. There is something very therapeutic about wiggling things around until they find their "home".